Base on the Samsung Original Docking Station, Better than it. 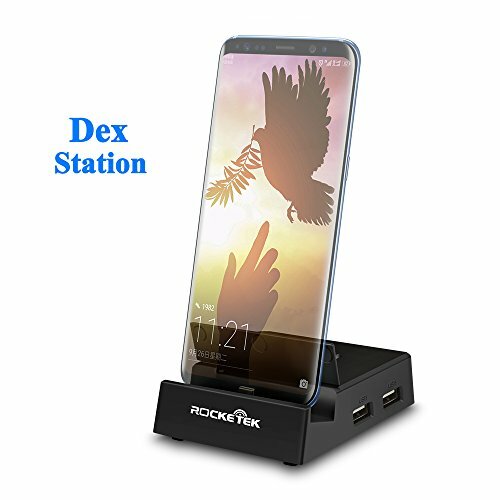 Ideal design to replace your original Cellphone docking station. Rocketek Multi Station Dock is smaller, more lightweight, more portable with stronger functional to compared with the original dock. Easy To Use - Insert the HDMI cable and the power cord into the Multi-Station first, Turn on your Smart mobile phone and then plug into this dock, then it will work. Portable Design - Folding Stand Design, Small size and lightweight docking station allow you take it to anywhere more easy. Step 1: Power by Original Type-C AC adapter or Rocketek RT-SC Power Adater. Step 2: Connect HDMI and turn on TV/display screen. Step 3: Turn on your Cellphone then plug into the dock. Step 4: After power on, Switch display turn to TV display, mobilephone Screen goes out. 1. Please use the Original Type-C AC adapter or Rocketek RT-SC Power Adater. 2. 100% of Our products have been well tested with Original Samsung Galaxy S8 & Hawei Mate10 before delivery, if you have any problem please feel free to contact us by support@rocketek.hk. If you have any questions about this product by Rocketek, contact us by completing and submitting the form below. If you are looking for a specif part number, please include it with your message.